US-based safety wearable tech company Wearsafe Labs Inc has raised nearly $3 million (around Rs 20 crore) in a fresh round of funding led by former Goldman Sachs partner Ravi Singh. As part of the transaction, Singh has been appointed to Wearsafe's board of directors. Andy Stewart, former managing director and global head of BlackRock Alternative Investments, also participated in Wearsafe's latest round of funding, a company statement said. "In a market that is saturated with gadgets, there is a tremendous need for a personal safety device that is not only adaptable to every person's life, but one that works when it is needed most," said Singh. Indian origin Ravi Singh, who is a Columbia University alumni, has spent a major part of his career at Goldman Sachs where he headed the global operations of the brokerage vertical. He has also served at asset management Credit Suisse as its global head of alternative investments. He is also the president of TruMid Financial, an electronic broker-dealer registered in New York. 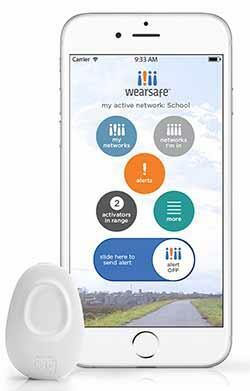 Launched in January 2014 by Phill Giancarlo and David Benoit, Wearsafe manufactures a product called 'Wearsafe Tag', which can be worn as a wrist band, clipped against body wear or as a loop. The Tag connects to a user's smartphone using Bluetooth Smart (low energy) technology and with the touch of a button instantly connects a user with a selected network of family and friends. When activated, a user's network immediately receives an alert through email, text and the Wearsafe app, and a group chat is initiated and friends and family can see where someone is located with the GPS information provided as well as instantaneously hear audio from their location. The Tag also provides the user with tactile confirmation (vibration) to let them know their alert has been received and help is on the way. "Software-only apps require a user to directly interact with their phones in an effort to call for help. People find themselves needing assistance when they least expect it and accessing their phone is often not a viable option. If a person meets an accident that phone is likely out of reach. If a person is in a threatening situation reaching for the phone can cause those circumstances to escalate," said David Benoit, co-founder of Wearsafe Labs. In July this year, Wearsafe raised a total of $106,084 from 1,107 backers on the crowdsourced funding platform Kickstarter over a one-month campaign that ended in August. Last week, Leaf Wearables, a Delhi-based maker of connected jewellery for women, raised $250,000 (around Rs 1.67 crore) in seed funding from serial entrepreneur Ajeet Khurana, Omnivore Ventures' Jinesh Shah and other angel investors. Leaf Wearables makes - SAFER—a wearable device that can be worn as a pendant or a bracelet. It sends signals to pre-stored phone numbers. It can also be used to trigger alarms, monitor movements and receive notification alerts besides clicking selfies. SAFER is connected to a smartphone through an app interface. Ravi Singh Wearsafe Labs Inc.